A Publisher’s Weekly Best Book of 2009. Gregory (Pandemonium) produces a quietly brilliant second novel… A wide variety of believable characters, a well-developed sense of place and some fascinating scientific speculation will earn this understated novel an appreciative audience among fans of literary SF. Gregory speaks here with a fresh voice, through a formidable talent already under canny control. 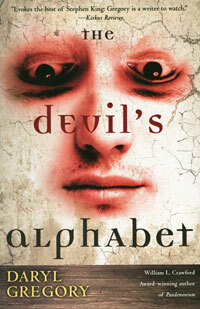 The Devil’s Alphabet, his second novel, is clearly the work of an accomplished novelist. It affords the reader not only visceral storytelling thrills but also poignant insights into almost all of its characters—insights that resonate well beyond its final uplifting page. Published on November 24, 2009, from Del Rey Books, a story about quantum evolution, murder, and what it means to be human. Thirteen years ago, the tiny mountain town of Switchcreek, Tennesse went through the Changes, an epidemic that left hundreds of townspeople dead, and transformed most of the rest into three clades, three alternate forms of human: The Argos, chalk-skinned and twelve feet tall; the hairless, all-female, fast-breeding Blanks; and the bulked out Charlies, some of whom are walking pharmacological factories. The epidemic never repeated, the disease never spread beyond the original victims, and the cause was never found. After the quarantine lifted, the world moved on. Everyone except for Pax Martin. Pax was one of the “lucky” ones, seemingly skipped by the Changes. Sent away from Switchcreek when he was 15, he’s coming back for the first time for the funeral of the girl he loved. Pax slowly begins to realize that he knows nothing about his hometown. Each clade has its secrets, and the Changes may not be over. The solutions to these mysteries will change the planet.